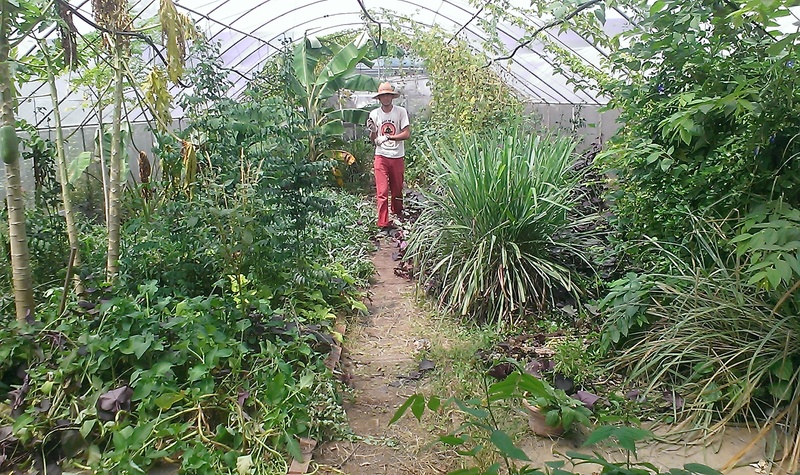 Natural farming Fukuoka-style on 100 sqm in Singapore. When we started work on Project Green Valley, it was but a barren piece of land with grass growing on hard sun-baked clay. I remember wondering where so many fist-sized stones came from. They were actually hardened and dried pieces of clay. The soil was in bad shape and there was a lot for us (and nature) to do before we restore fertility. After about a year, this is how it looks. A food forest! See if you can spot sweet potatos (green, purple, yellow), kang kong, wild spinach, sweet leaf, papaya, banana, tapioca, bitter gourd, lemongrass, citronella, passion fruit, and more! One thing I really enjoy at a permaculture garden is that you can litter without feeling guilty. Growing up in spick-and-span Singapore we have been taught since young to put litter only in the rubbish bin. Any piece of trash left on the concrete floor is an eyesore and has to be cleaned up by someone else. This is why it felt so liberating when I could throw my organic waste anywhere in the farm. In fact, my act of littering will be adding to the fertility of the soil and if I was lucky it might even be seeding a tree! 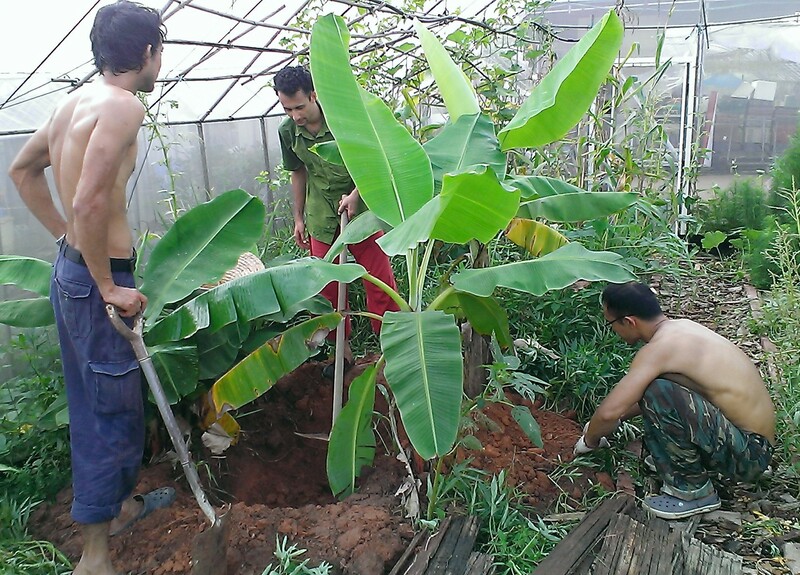 Project Green Valley – Our Very Own! 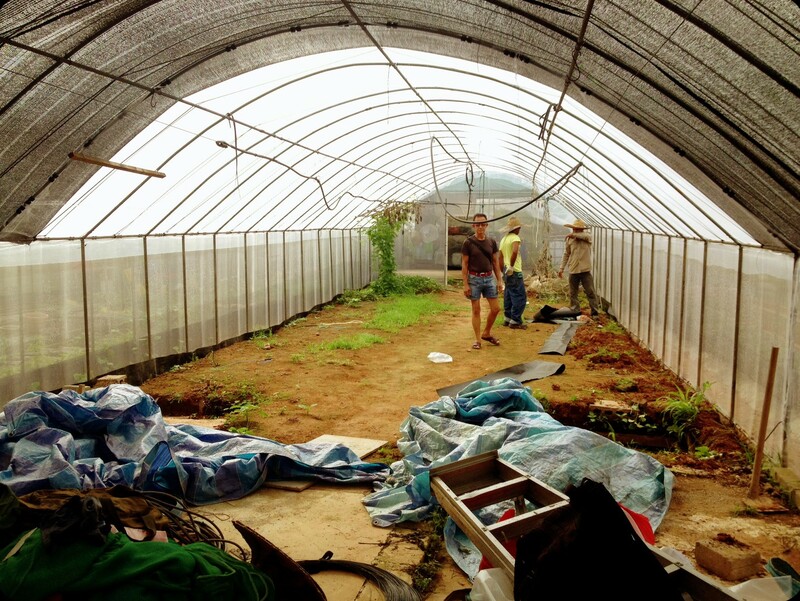 Most of our time at Edible Gardens is spent building food gardens for other people. We design the gardens based on their aesthetics and we grow the plants that they like to eat. It’s still lots of fun but you feel different when it is your own garden. In this sense we are very lucky to have a small plot of land that we can do anything we want. Barren land when we first took over. Polytunnel overhead. Ok, our land is not really ours since it is adopted from Green Valley Farms, a commercial organic farm that has set aside part of their farm for recreational farmers/gardeners to adopt plots to grow edible plants.